DIE Veneris, 4 die Januarii. Ly Frazer et al. Nat. Bill. Scawen's Bill, to be restored in Blood. Report of the Conference on the Coinage Bill. Bill to regulate Prices of Provisions. Epus. Rochester. Edwardus Comes Clarendon, Ds. Cancellarius Angl. 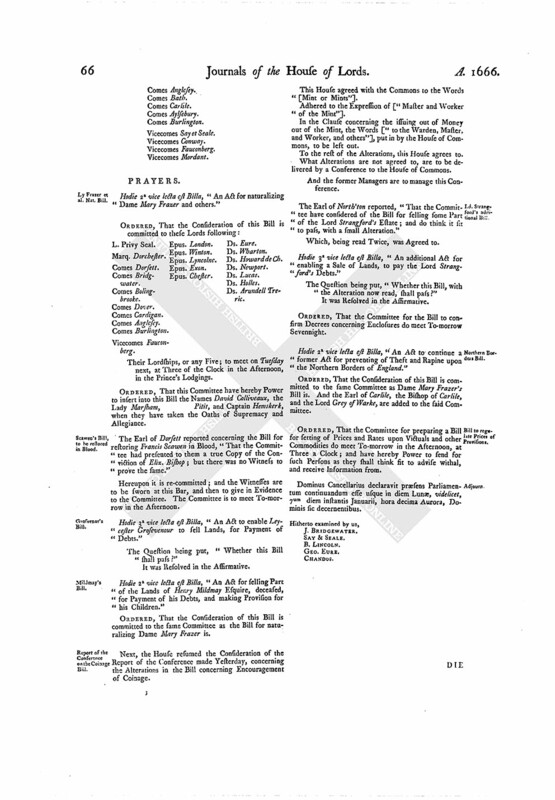 Hodie 2a vice lecta est Billa, "An Act for naturalizing Dame Mary Frazer and others." Their Lordships, or any Five; to meet on Tuesday next, at Three of the Clock in the Afternoon, in the Prince's Lodgings. ORDERED, That this Committee have hereby Power to insert into this Bill the Names David Colliveaux, the Lady Marsham, Pitit, and Captain Hemskerk, when they have taken the Oaths of Supremacy and Allegiance. The Earl of Dorsett reported concerning the Bill for restoring Francis Scawen in Blood, "That the Committee had presented to them a true Copy of the Conviction of Eliz. Bishop; but there was no Witness to prove the same." Hereupon it is re-committed; and the Witnesses are to be sworn at this Bar, and then to give in Evidence to the Committee. The Committee is to meet To-morrow in the Afternoon. Hodie 3a vice lecta est Billa, "An Act to enable Leycester Grosevenour to sell Lands, for Payment of Debts." Hodie 2a vice lecta est Billa, "An Act for selling Part of the Lands of Henry Mildmay Esquire, deceased, for Payment of his Debts, and making Provision for his Children." ORDERED, That the Consideration of this Bill is committed to the same Committee as the Bill for naturalizing Dame Mary Frazer is. Next, the House resumed the Consideration of the Report of the Conference made Yesterday, concerning the Alterations in the Bill concerning Encouragement of Coinage. This House agreed with the Commons to the Words [Mint or Mints"]. Adhered to the Expression of ["Master and Worker of the Mint"]. 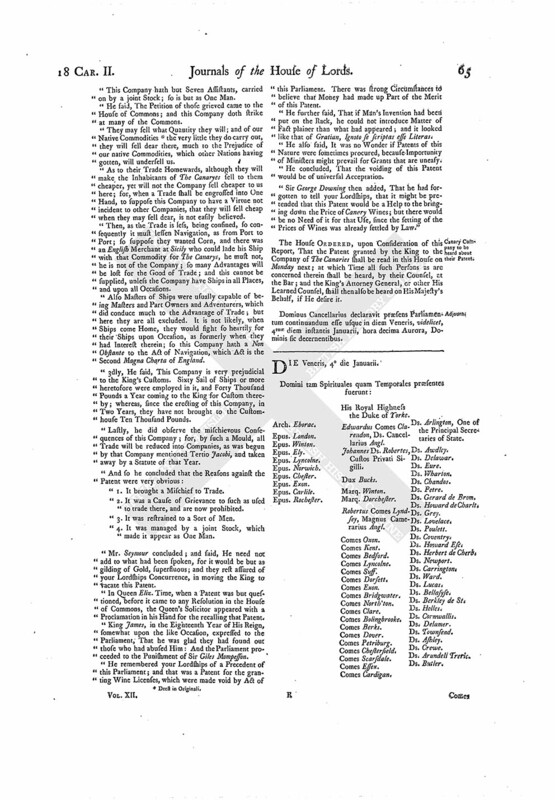 In the Clause concerning the issuing out of Money out of the Mint, the Words ["to the Warden, Master, and Worker, and others"], put in by the House of Commons, to be left out. To the rest of the Alterations, this House agrees to. What Alterations are not agreed to, are to be delivered by a Conference to the House of Commons. And the former Managers are to manage this Conference. The Earl of North'ton reported, "That the Committee have considered of the Bill for selling some Part of the Lord Strangford's Estate; and do think it sit to pass, with a small Alteration." Which, being read Twice, was Agreed to. Hodie 3a vice lecta est Billa, "An additional Act for enabling a Sale of Lands, to pay the Lord Strangford's Debts." The Question being put, "Whether this Bill, with the Alteration now read, shall pass?" ORDERED, That the Committee for the Bill to confirm Decrees concerning Enclosures do meet To-morrow Sevennight. Hodie 2a vice lecta est Billa, "An Act to continue a former Act for preventing of Theft and Rapine upon the Northern Borders of England." ORDERED, That the Consideration of this Bill is committed to the same Committee as Dame Mary Frazer's Bill is. And the Earl of Carlile, the Bishop of Carlile, and the Lord Grey of Warke, are added to the said Committee. ORDERED, That the Committee for preparing a Bill for setting of Prices and Rates upon Victuals and other Commodities do meet To-morrow in the Afternoon, at Three a Clock; and have hereby Power to send for such Persons as they shall think fit to advise withal, and receive Information from. Dominus Cancellarius declaravit præsens Parliamentum continuandum esse usque in diem Lunæ, videlicet, 7um diem instantis Januarii, hora decima Aurora, Dominis sic decernentibus.